My PC has been running slow for ages now and I have been putting off building a new one for just as long. I put my existing one together about 3 years ago which is quite long for me. I used to build new ones a couple of times a year – those days are gone. 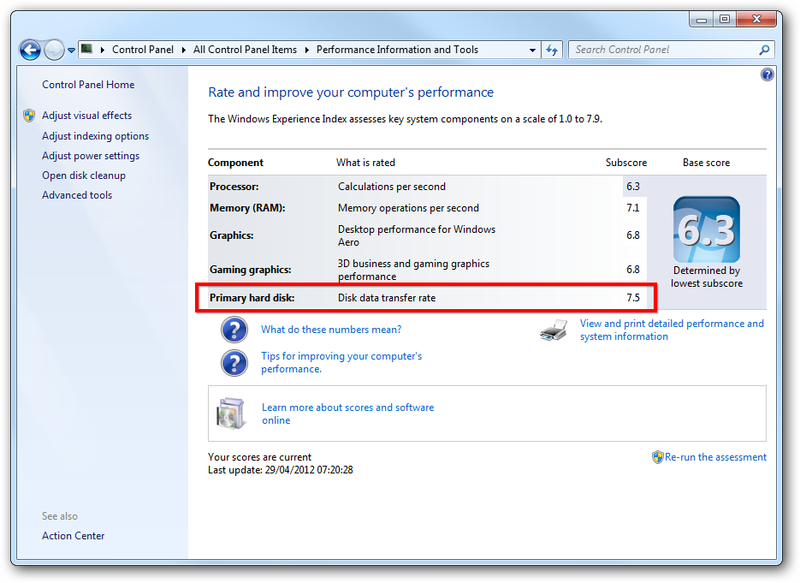 My windows experience rating was low (5 point something I seem to remember). This was brought down by the lowest score of them all which happened to be my mechanical hard disk. I noticed on Amazon the Crucial 128Gig solid state drives were around the hundred quid mark so I decided to take the plunge and try one out as my primary drive. Whoa! The PC is now going like the clappers compared to before! Files actually open the moment you click them (as they should)! I’m happy because for the sake of a hundred quid I have saved myself a small fortune building a new PC which I just didn’t need at the moment. Install was easy. Just backed up my files and attached the SATA SSD. I installed Windows 7 from the DVD. It asked me a few questions and away it went. If memory serves me correctly, the process took way less than an hour. The only problem I had was when it came to removing my old hard drive, I couldn’t boot from my new solid state drive because the boot record was still on my old drive as this screenshot from Disk management shows. BCDboot came to the rescue. Its a tool which is used to repair the boot environment. i just told it where my windows installation lived and it did the rest. 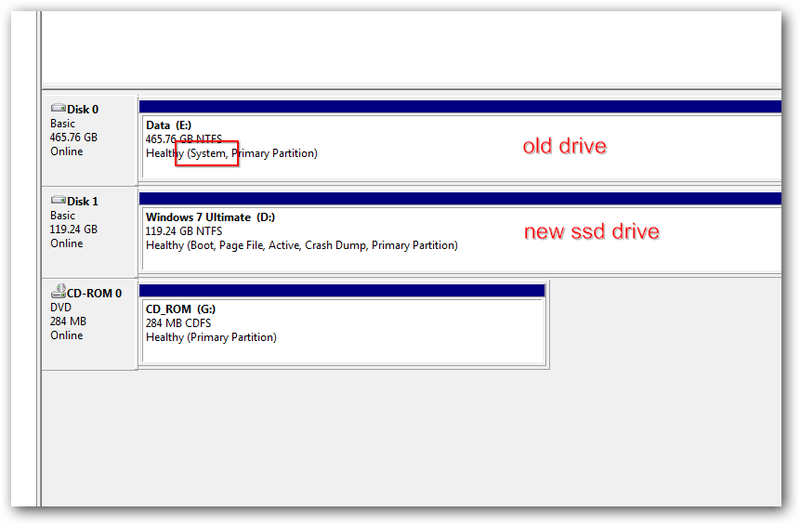 Finally, I could remove my slow old 500Gig drive and my machine booted from my SSD drive. 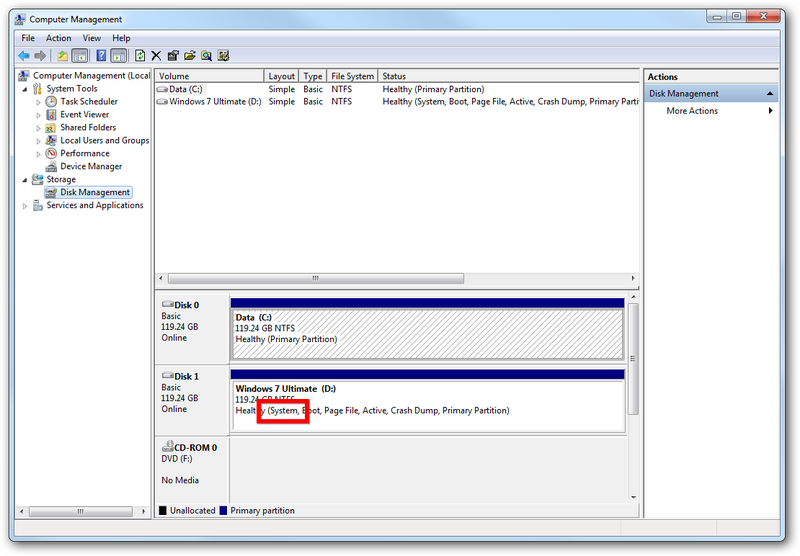 The screenshot below shows disk management with the primary SSD drive fixed, a second SSD and my old mecahanical drive removed. I now have a useable machine at last. I’m happy!